Elena Gilbert vs. Bella Cullen. 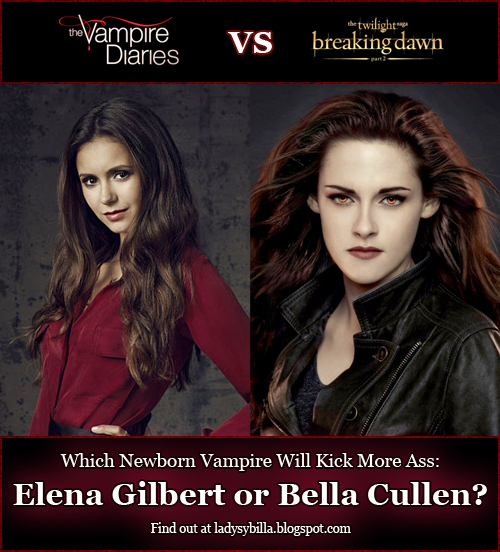 Which vampire will kick meer ezel this fall: Bella Cullen of Elena Gilbert?. Wallpaper and background images in the The Vampire Diaries club tagged: elena gilbert bella cullen vampire diaries season 4 twilight saga finale. This The Vampire Diaries photo contains anime, grappig boek, manga, cartoon, and stripboek. There might also be krant, tijdschrift, tabloid, vod, papier, rag, portret, headshot, and close-up.